There are culturally common activities like wine and cheese tastings that explore variations of a particular theme. 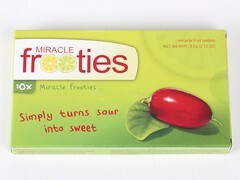 There are also flavor tripping parties specifically for trying out the taste bud altering miracle fruit. And there are molecular gastronomy and modernist cuisine that are intended challenge your expectations of texture and flavor. In the spirit of these kinds of experiences, we came up with a wide-ranging set of interesting (and sometimes challenging) items that can be shipped through the mail and shared between internet friends. 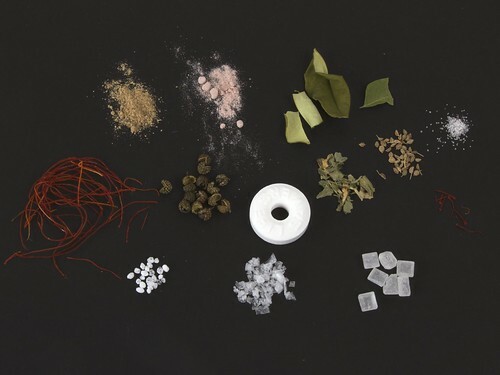 The goals of the project include isolating a few interesting flavors that are not normally tasted on their own, understanding a bit about the ways that shape and texture affect flavor, and play a bit with some of the available “mouth altering” spices and flavors. Most of the items we included in our tasting kit are from Indian or asian grocery stores. For herbs and spices, getting them from a shop with high turnover will help in obtaining fresher spices that are more full of flavor. They’re also likely to be less expensive at places that expect larger quantities of spices to be used in foods (we’ve written about this before). Ethnic groceries are better at this than mainstream ones, and places with bulk bins can be just about the worst. A few items we shopped for online, and a couple came from our garden. For tasting order, we opted to start with more subtle flavors and end with mouth-altering ones. Our general itinerary was divided into four parts: flavors & scents, shapes, adventures, and light. Of special note: many people are sensitive to particular (and sometimes esoteric) food items. Be sure you have discussed food allergies with all participants before plying them with unknown ingredients. Decide if you want to try things before announcing what they are. Have water and neutral flavored crackers or bread for cleansing the palette between flavors as needed or desired. One of the joys of life is introducing people to new flavors and textures that you love, whether they are from your own kitchen or your favorite restaurant. Every so often, that will backfire, when someone ends up not liking your beloved dish. But sometimes you’ll see that “eureka” moment when someone lights up from the new experience. Eating involves many kinds of sense perception, including smell, taste, texture, temperature, and sight. Fenugreek Leaf (Methi): fenugreek has an aroma reminiscent of maple syrup and is one of the magic ingredients in tandoori marinades. Crumbling dry herbs in your fingers will help release aromas. Makrut (Kaffir) Lime Leaf: a crucial ingredient in many Thai curry pastes and soups. 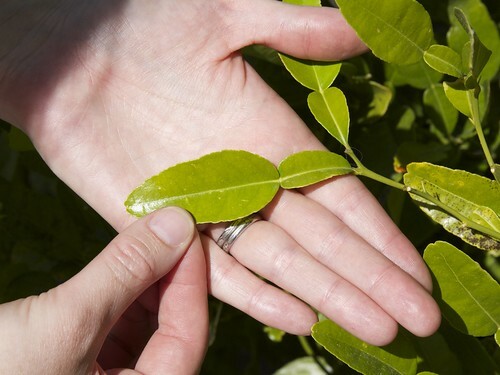 This double-lobed citrus leaf is available fresh at many asian groceries, and we’ve written about it before. Curry Leaf: used in south Indian cuisine, such as the soups you find at dosa shops. We have a little curry tree, but leaves can be obtained fresh at Indian groceries. Ajwain: spicy, somewhat reminiscent of thyme or oregano. Also from Indian cuisines and spice blends. 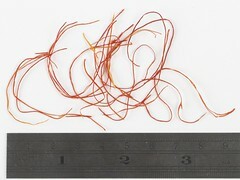 Saffron: always used in very small amounts due to its potency and expense. Almost never tasted alone. Chat (Chaat) Masala: used primarily on Indian snack foods. Key spices include black salt, mango powder, cumin and asafoetida. Try it on some fresh fruit. Black Salt: very sulfurous pink colored salt mined from the Himalayas. Truffle Salt: an excellent way to experience the heady aroma of truffles. Try sprinkling it on vanilla ice cream. 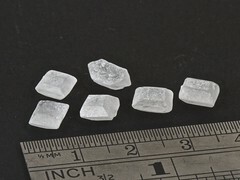 Sugar Crystals: these large (~1/4 inch) sugar crystals are available at Indian and middle-eastern markets, sometimes labeled as “sugar cubes” despite their elegant shapes. They don’t seem as sweet as granulated sugar because of the low surface area to volume ratio. 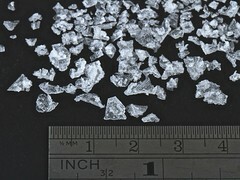 Salt Flakes (hopper crystals): because of the huge surface area, these taste even saltier than granulated salt. Great for when you want to have lots of salt flavor and are sprinkling on a surface that will not dissolve the salt. Trader Joe’s is selling small containers with huge crystals. 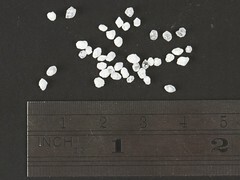 Alternately, Maldon Sea Salt Flakes are large enough to see the crystal structure. 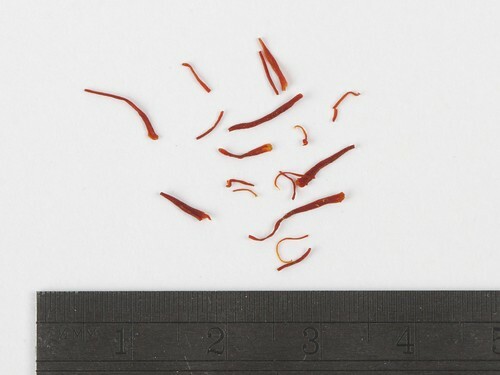 Shredded Red Pepper: we came across these dried pepper threads at a Korean grocery store and have been garnishing our soups with them ever since. They’re preserved with salt and rehydrate to show the cross section from the center of the fruit to the skin.They’re beautiful and spicy, but not as spicy as red pepper powder because of the difference in surface area. Citric Acid: we found large granules of this at an Indian market. One big granule is enough to make just about anyone pucker. This is the full-strength version of the powder that is used to make sour candies sour. 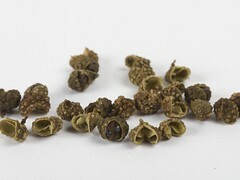 Sichuan Pepper (Prickly Ash, Wild Peppercorn): one of the components (hydroxy-alpha-sanshool) triggers an anesthetic reaction. After chewing on a couple of these husks, your tongue will go numb and tingly. It increases your ability to eat super spicy foods, and has been described to us as “a party in your mouth.” We’ve also seen very panicked faces of people who just wanted the sensation to stop. Some people don’t seem to be as sensitive to it, or perhaps didn’t get very active pieces, and they usually find the lemony flavor to be pleasant. 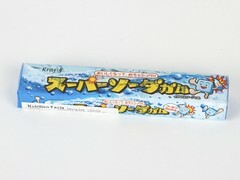 Super Soda Gum: we discovered this great bubble gum through the Candy Japan subscription service and we now purchase it at our local Japanese grocery store. It has a powerful punch of fizzy powder inside, which makes your mouth foam up like crazy. It is awesome good fun, and it seemed to help the sichuan pepper effect to subside. Even after the excitement from the foam settles down, it is really good quality gum. Miracle Fruit Tablets: we got these tablets from Amazon. They’re a little bit expensive, but the miraculin binds to sweet receptors on the tongue, making sour foods seem sweet. The berries are also available, but are more expensive, and harder to get shipped. Citric Acid (again): after dosing with the miracle fruit, citric acid tastes like candy. Be careful, or you’ll inadvertently eat a lot of highly acidic food because it is so fun. Try other sour foods like lemon, lime, grapefruit, vinegar, and tamarind. Wint-O-Green Lifesavers: sugar crystals are a triboluminescent material, meaning that when you crush them, they emit light. However, they emit ultraviolet light, and so we don’t normally get to see the effect. Wintergreen oil fluoresces blue, so eating wintergreen flavored candies in the dark in front of a mirror or with friends will let you see it. Go into a very dark room. Wait until your eyes are accustomed to the dark. Bite the mints with your teeth to crack them to see the glow. Asafoetida (Hing): a very powerful garlic and onion substitute from Indian cuisine. Seaweed: for someone who hasn’t been exposed to the flavor of dried seaweed, it can be a shock. Dried Sumac: a sour fruit used in the spice blend za’atar along with sesame seeds and dried herbs. Tamarind: a sour fruit that is less well known in mainstream American cuisine, but can be found in many familiar sauces (even some Worcestershire sauces). Commonly available as a paste or as pulp. Other less common fruits, such as dragon fruit, soursop, jackfruit, and durian. Fresh vs. freeze dried vs. canned textures and flavors. From our group came the suggestion to create a flavor symphony, walking through various movements of flavor rather than isolating each one. It could be interesting to add more familiar herbs like mint, thyme, and rosemary to the mix. An exploration like this is fairly simple to lead when everyone is in the same place, but can also be done remotely. 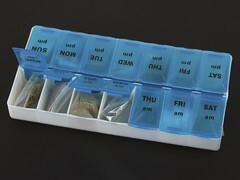 We packaged up our ingredients into little bags and tucked them into plastic organizer boxes (commonly available from the dollar store) to conceal the contents until the right moment. The list above is strongly influenced by our personal experiences and cooking preferences. Depending on your background, things we find exotic may seem perfectly normal. It is interesting to see which ingredients stir up memories from the participants, and which are new to them as well. If you come up with other ideas, we’d love to hear about them! This entry was posted in EMSL Projects, Play with your food, Science. Bookmark the Permalink. I teach a very similar science of taste class, and recommend adding MSG for umami.